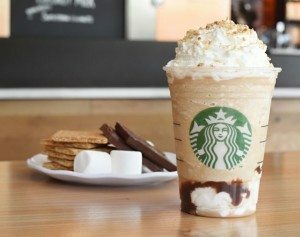 The S’mores Frappuccino is back!! Starting tomorrow, April 23, 2016, the S’mores Frappucccino makes its official return, everywhere in Starbucks stores in Canada and the United States! This was an incredibly popular Frappuccino last year, and by popular demand, it IS back! I admit that I had a weak spot for the awesome milk chocolate sauce used in this drink! I got the official word from Starbucks media relations this afternoon. Erin S. wanted to make sure that I knew that “starting tomorrow S’mores Frappuccino is back“. It is official. The S’mores Frappuccino stirs memories of making s’mores around a campfire with marshmallow-infused whipped cream and milk chocolate sauce along with a creamy blend of coffee, milk and ice. It is finished off with marshmallow-infused whipped cream and a graham cracker crumble. Starbucks Rewards members (who are at the Gold level), go enjoy a S’mores Frappuccino after 2:00 PM tomorrow the 23rd, and you’ll earn double stars! I’ve heard rumors that they replaced the graham syrup with vanilla in the recipe. Is that correct? It still was rwally tasty!! Love this drink. And I spelled really wrong. Ugh! As a partner I love new drinks to share with my customers but I wish they weren’t so taxing. It takes extra time with isn’t a problem unless I have 4-5 in row and people get mad at me when I am working on them. Why? Because they have a simple latte and it is a drink or two later than the Frappuccino. 🙁 Also I’m glad it isn’t every day so you as a customer have to come in to get it during summer to get what you have been craving for a year! I haven’t found any stores in my area that are actually serving this. They say it’s coming soon but don’t know when. Disappointing! @Kelsey – Your area should have this drink now! Starbucks very, very, very last minute changed the launch date of this. This shows you that some stores don’t keep up on what’s new on the HUB – You’re not the first person to say that their stores don’t have it. It seems like the short, short notice worked for a lot of stores, but not without stress, and for some stores, they just didn’t get up to speed. I went to my usual Starbucks Saturday afternoon hoping to get one – the barista told me they wouldn’t have them until June. Then Sunday morning, I went to a different store and they had S’mores frappuccino art on their chalkboard. @Meghan – I’m very interested in your story and would be interested to know if others had the same experience. The real story is the other story of what happens when Starbucks springs a drink on all their stores with a few hours notice. 🙁 It tells you who is frequently checking the HUB and who is not so much. I’m in the LA area and the two big Starbucks I go to weekly on the west side don’t have it yet. Was hoping to get one because I am a tea person and this is the only frapp I enjoy!